Rentz - thanoscardgamess jimdo page! Rentz is a skilful card game. 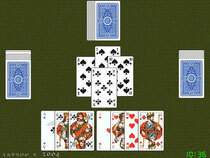 A deck of 32 cards is used for 4 players. In the course of a session, each player will play each of the seven contracts once. In each of these contracts, each player is playing for herself. There are five "negative" and two "positive" contracts. In all the contracts, there are no trumps. The negative contracts are: No Tricks, No Queens, No Diamonds, No King of Hearts, Totals. The positive contracts are: Tricks, Rentz. You may play it with french-suited decks or with the Willhelm Tell deck.